To first understand the meaning of floating, we must look at the environment it is used in. 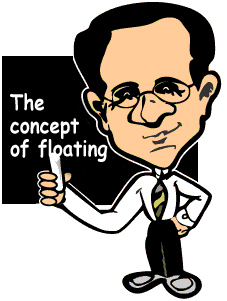 The word ’float’ has synonyms such as ’drift’, ’glide’, ’hover’ and ’hang’. From these synonyms we can see that, when put into a poker situation, it means that we stay on the surface with an insecure hand upon the flop, and continue to drift along with the intention of grabbing hold of the pot later on. To put it in a nutshell, floating is an alternative to bluffing, which is typically carried out on the flop or on the turn. The main aim along these lines (calling on the flop and raising on the turn) is to make our opponents believe that we hold the better hand and aim to take the pot before the river. An essential element for us to succesfully float is to call our opponent’s bet on the flop (this is the street where we drift with our hand) and given, that the competition checks on the turn, we take the pot with a firm raise. Basically, this can be managed with any two cards, that is why floating is considered as a sneaky type of bluff. It is also very important to note, that in my opinion it is never wise to call a preflop raise with any trash cards just to be able to float (viz: do not call a preflop raise with 85 off-suit just to float with it)! A successful float consists of two streets (flop and turn) and not three (preflop, flop and turn). As mentioned before, a player who seeks to be a professional floater should easily understand both preflop and postflop gameplay and should definitely know what a cbet is. 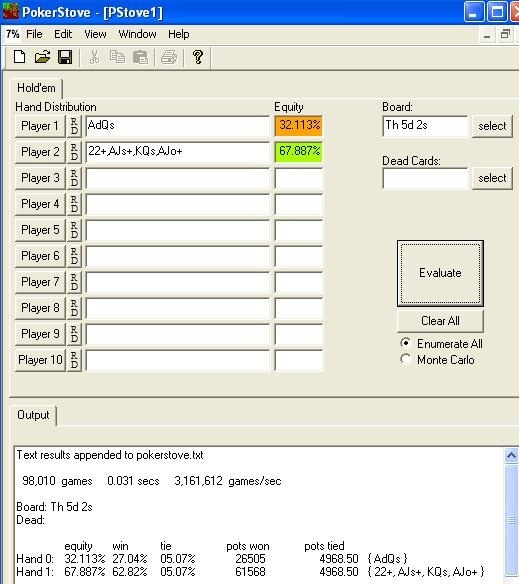 Above all this, it is also essential for a player to be able quickly categorize their opponents and to know in what situations and how often their opponent use the cbet (viz: your should be able to read your opponent). You raise with two high cards from an early position and receive one call. 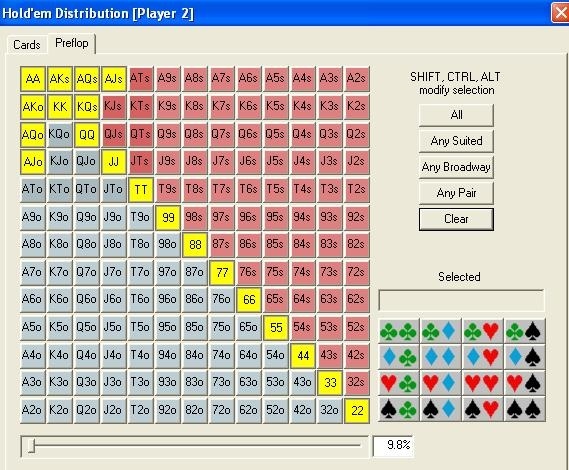 Unfortunately, the flop of no use for you, but it structured in way that makes you think it is worth trying out a cbet. Upon a short pause of pondering, your opponent calls. The turn is no help. What do you usually do in a situation like this? Most of the time, the answer to this question would be to check the turn, because judging by your opponent’s call on the flop, they either hold some kind of a draw or better cards than you. The pot size on the turn is usually so big that a TAG player will not raise again with nothing (not using the second barrel), so the player only calling on the flop will take the pot with a simple bet (it doesn’t matter if he had a big hand or just floated with nothing). The flop is T 5 2, which is not good for you, but it is probably not of value to your opponent either, as only the pairs TT+ would be considered as good in this case. From your opponent’s point of view, this flop is completely dry and suitable for a cbet, so it doesn’t come as a surprise that he bets $5.5 on the flop. It would also be interesting to consider our odds against the range mentioned above, but this is not of crucial importance to the flop. The reason for this is that our opponent will (because of his positional disadvantage) check with a lot of hands that are better than ours and will even fold in most cases, given that we raise on the turn. We use the above mentioned logic and decide to float with our two overcards (we still have a great chance of 6 winning outs!). The turn comes 6, our opponent checks, which will indicate weakness in most of the cases (he will do this with every small pocket pair he holds and also with hands like KQs, AQo, AQs, AK and AKs). At this point of time, we can easily presume that our opponent will fold to a bet that demonstrates strength, so we bet $15 in the $20 pot (it is very important that our bet is proportionate and does represent a strong hand). The expected outcome from this situation against an average tight player is that he folds under the pressure and we get our mitts on the pot. This, in most of the cases, will play out well, but of course, if our opponent calls or re-raises on the turn, it is best to drop out for that round and stop floating in this situation. In order for float play to be truly successful, it should only be one-on-one situation where we are in position on the flop. Why is this important? If more than one opponent happens to see the flop, chances of it hitting someone are much higher. The scheme is easy: the more players see the flop, the less reasonable it is for us to be bluffing. In order to understand the positional requirements of floating, we need to imagine how the game shown above would have went down if we would’ve been out of position. We wouldn’t have had the opportunity to win the game with our bluff on the turn, as for at that point we wouldn’t have had any information on our opponent’s hand. Of course, another type of floating is when we are out of position and we raise on the river after our opponent checked on the flop, but the efficiency of this is much smaller as that of a turn bet. This is because our opponent will have to put in a much smaller sum of money. This means that the opponent won’t have to worry about facing a big bet on the river with his weaker hand. Last, but not least: if we happen to be out of position, we will be generous and give our opponent a free card in this situation. So, let’s stick with the simple solution: we should only consider floating if there is just us and our opponent and we are in the right position. Second barrel, or what happens to us if the opponent raises again on the turn? In my opinion, it is best to fold in the majority of these cases. It is not worth to fight a battle that can hardly be won, but it is also true that there are many players who raise in the turn holding nothing, just because they are aware that you can float. At this point, it is not what you know, it’s who you know and, of course, what they know about you. By this we mean all information gathered in previous hands can be used against our opponent to judge the best call. If you know your opponent well and see through his regular second barrel (or you judge by the size of his bet or the timing tell that he is very weak), let your instincts kick into play and take the pot with a re-raise on the turn. Watch out, though, you are skating on thin ice here, as for the pot will swell and you will have to mobilize big amounts of money for your bluff. This gameplay is only recommended for the most experienced players. Against what kind of opponents and on what flop is it worth to float? As previously mentioned above, the tactics discussed in this post are the most useful against tight-aggressive players who easily fold following a cbet. Their range is easy to judge/predict and don’t hold big surprises as those of a loose-aggressive player. Float play should be avoided against players who tend to follow us to the river with very weak hands. In other words, if your opponent is a calling station, you should wait until you have a strong hand in your possession and not try to bluff him on the turn. Because chances are, that the loose-aggressive player will bluff you out and not vice versa. Another important aspect of maximizing the float is to recognize the flops that are truly worth floating. If the flop happens to be A K Q or 678, it should not be considered to float. Why is this? If the flop contains too many high cards, our opponents have a greater chance of hitting one of them and the more drawing possibilities there are, the less chances we have of them folding. We should be on the lookout for the dry flops for floating. Another interesting question that can be raised is whether flops containing an Ace are worth floating. In my personal opinion, we should avoid floating under these circumstances, as our opponents are quite likely to hold an Ace (see the range discussed above). Also, in a lot of cases, the opponent will call your bet even if he happened to check on the turn (this is because a good tight-aggressive player will go for pot control in these cases). So, on a flop that contains an Ace, we should restrain ourselves from considering to float, there will be other great opportunities to pull it. How often is it worth floating? It is easy to become addicted to floating, but it is our best interest to keep our composure and self-control on the number of situations we use it. This is because our more intelligent opponents can and will easily turn our deadly weapon against us by check-raising us on the turn. On the opposite side of the spectrum, you can also do the same against frequent floaters, but only if you hold a good hand. Floating is a very useful tool and used right, can be a weapon to collect precious BBs and improve our efficiency in the long run. To comprehend and apply the principles discussed is, in my opinion, essential at tables above NL100, and as we progress to higher stakes, it becomes a completely natural part of gameplay, which is necessary, but not satisfactory. I would appreciate your feedback and any comments on this post. Also, for those who feel I have forgotten to add something, please feel free to express your opinion.